It is week #11 and I want to thank everyone for taking the time to join us for tailgating time each week! I know everyone schedules has to be as busy as mine, but after all we do enjoy good food!! And what is more fun than sharing good food with good friends? 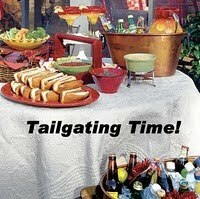 Join us for week #11 of Tailgating Time! Come on! it's easy, just add your link! It's all about the food, and sharing it with others!! This week I'm bringing my Chayotes Rellenoes, a nice cheesy appetizer, or side dish, or breakfast, or lunch. I was up early to get everything ready for my crock pot for a dish I'll try to get posted this week! I don't use my crock pot enough, but it's nice if you can plan ahead. That way it frees up our Sunday and dinner is ready when we get home! I actually found some leaves changing colors here in Florida! Well alt least some that were not my banana leaves turning yellow! This was at Turtle Beach Park after we had the boat out all day last Sunday. I think it's a vine that lives in the trees, but it sure looks like Autumn, even though it doesn't feel like it! See not much to look at, and my camera setting was off, but you get the idea! Will post our boat trip later! Have a wonderful rest of the weekend you all! I am hoping to grow Chayotes when I make the final move to France. I grew them in S.Africa and loved the versatility of them. This sounds like a great dish. Everything looks beautiful. Unfortunately we miss all the fun in Canada and don't tail gate. I look forward to seeing all the dishes. I love chayote..the baked looks wonderful. Thanks for sharing the beautiful photos too! My kids super love one pot meal! I only make that when hubby went outstation. Then, I can more times for myself. ha! See, you can even take a walk at the beach after throwing everthing in the oven. ^_^ Hope you'll have a great week ahead, Lyndz! I love the photos and the recipe. Would you share one of your recipes at My Meatless Mondays on my blog? You have interesting recipes. Each one is distinctive. I always enjoy your beach pictures! Your chayotes look really good. I've never had them before. Thanks for hosting and sharing your great recipes. Beautiful photographs Lyndsay. Love the idea of using Chayote squash for this dish. I love chayote too, Thanks for sharing this beautiful photos. this is an unusual dish! have never tried chayote but would love to in this!